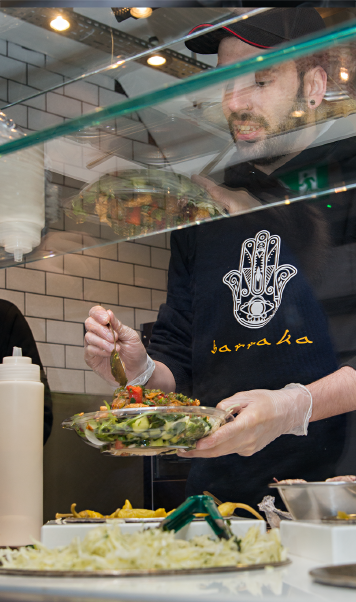 Barraka is a newly opened Mediterranean takeaway nestled in Artillery Lane, between Liverpool Street Station and Spitalfields Market. Ideal for a quick lunch away from your desk, or to grab something before you head to the pub after, Barraka serve food fast and fresh. The staff are friendly and full of enthusiasm. If you are a first-time customer you will get a cheer and the gong will be banged in your honour. They believe in a relaxed and welcoming atmosphere - get this right and all else will follow. 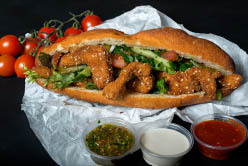 From the menu you can choose a baguette, a Laffa wrap or a salad. Then fill with a choice of Mediterranean chicken, Chicken Schnitzel, Halloumi, Steak, or Chorizo. Sauce options are Baraka sauce, Tahini, chimichurri or chilli. Believe me they are big portions! And they really are fresh and tasty. My chorizo wrap was a range of flavours from the soft sensual pork chorizo to the subtle heat of the chilli sauce. 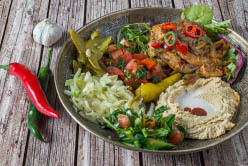 The Mediterranean chicken was steeped in the secret sauce, and it was sumptuous. Wander down Artillery Lane and you may be lucky enough to be offered a taster outside. 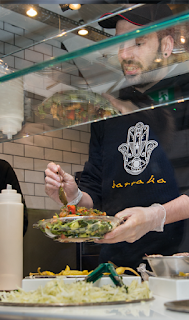 Judging from where I was sitting (at the window) the fast-moving queue, the number of passers-by tempted in, and the banter between the staff and the regular customers, shows Barraka is a 'blessing'. In July you can get a 25% discount on the food at Barraka by voting for your favourite dish below. Go along for your very own gong!